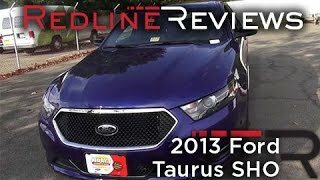 Ford unveiled the all-new Ford Taurus SHO sedan 2013; the sportiest model till date to wear SHO (Super High Output) badge. Find more details on what this performance Taurus has to offer and special SHO Performance Package after the jump. 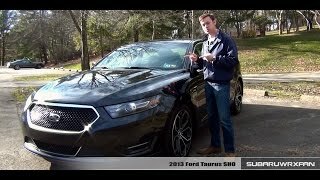 NEW YORK, April 19, 2011 – The new Ford Taurus SHO is the sportiest Taurus yet to wear the coveted performance badge. With its unique blend of the award-winning, fuel-efficient EcoBoost™ engine, enhanced driving dynamics and performance-inspired design, the new Taurus SHO shows it means business. An unprecedented combination of horsepower, technology and fuel economy takes this acclaimed sporting sedan to a whole new level. Inspired by SHO buyers and club enthusiasts, the design team knew just what to do. For the new Ford Taurus SHO, subtle differentiation from the other members of the Taurus family starts up front, with a performance-inspired grille in black mesh – unique to the SHO – flanked by series-specific high-intensity discharge headlamps. Behind the front wheel openings, a fender-mounted scallop contains a subtle SHO badge. Unique 19-inch premium painted wheels wearing standard P255/45VR-19 all-season tires fill out the openings, giving SHO a muscular, athletic look. Buyers can choose 20-inch machined and painted wheels. Inside, the new Taurus SHO communicates its sporty characteristics with a perforated leather-wrapped steering wheel, leather-trimmed sport seats with embroidered SHO graphics, unique woven aluminum trim and adjustable aluminum pedals with memory. Signature Ford technology is also a key attribute of the new Taurus SHO, with the addition of standard MyFord Touch™ powered by SYNC® driver connect technology and the replacement of several traditional knobs and controls with clear, colorful LCD screens and five-way buttons. These screens can be personalized to display information relevant to each individual driver using voice command, a simple button click or touch-screen tap. MyFord Touch is powered by the latest generation of Ford’s award-winning SYNC, including sophisticated voice control for vehicle functions, connected Bluetooth® devices, MP3 players and a wide variety of external media. The new Taurus SHO drivetrain continues to use the award-winning and fuel-efficient 3.5-liter EcoBoost V6, delivering 365 horsepower and 350 lb.-ft. of torque, mated to a six-speed high-capacity 6F55 SelectShift Automatic™ transmission. Steering wheel-mounted paddle shifters enable the Taurus SHO to match revs for smooth, quick, manually selected downshifts. For the new model, these have been reconfigured for more intuitive operation, with one paddle for upshifts and the other for making smooth, matched-rev downshifts. SHO dynamics have been enhanced with larger brakes, torque vectoring control – using slight braking to provide the effect of a limited-slip differential – and unique sport-tuned suspension. Taurus SHO brake system upgrades include a larger master cylinder, revised booster tuning for improved pedal feel, larger front rotors with 19 percent more thermal mass and 67 percent more swept area to help brakes run cooler. Now vented, the rear disc brakes offer 53 percent more thermal mass. As with the previous edition, all Taurus SHO models come standard with an advanced torque-sensing all-wheel-drive system to help deliver optimum traction in all weather conditions and to enable the vehicle to efficiently deliver ample torque through all four driven wheels when driving in a sporty, enthusiastic manner. 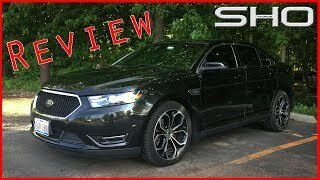 Direct, unfiltered feedback from the Taurus SHO enthusiast community and input from buyers of this reinvented icon reinforced the idea that evolving the SHO was a very good thing indeed. SHO builds on a platform of customer satisfaction. Taurus SHO is drawing new shoppers to the Ford showroom, based on its unmatched combination of 365 twin-turbocharged EcoBoost horsepower, torque-sensing all-wheel drive, available technologies and up to 25 EPA-rated mpg on the highway. 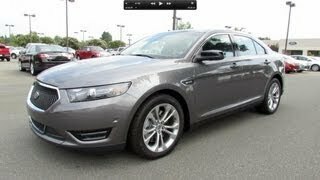 For discriminating automotive performance enthusiasts demanding the ultimate in uncompromised dynamics and response, the 2013 Taurus SHO offers a new Performance Package that is engineered to deliver greater handling responsiveness, power and durability under more sporting driving conditions. The new Taurus SHO will be produced at Ford’s Chicago Assembly Plant.